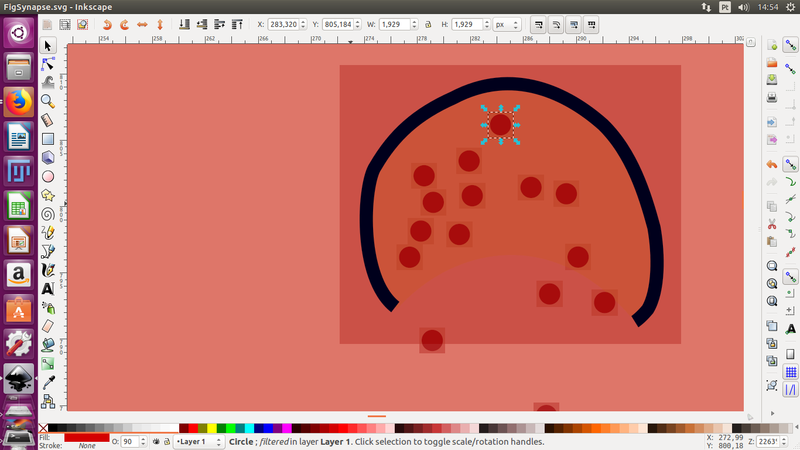 I'm creating this image with inkscape and never had this problem before. As you can see, a rectangle appears around each object. I don't understand why. How can I remove them? If you look at the bottom tab of the window(besides layer tab), the description still gives the info that some filter is applied on the object (circle; filtered in layer Layer 1). Select the circles and then try filters- remove filters. If this doesn't work, select the circles and try opening the filters- filter editor and deselect any filter that is applied on the object. Hope this works. Do you have layers with blend modes, like Overlay or Multiply? That could cause this effect and Inkscape shows layer blends as filtered in the taskbar.